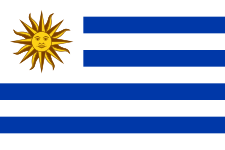 ^ Flag of Uruguay. The World Factbook. 美國中央情報局. [2007-06-27]. ^ 2.0 2.1 Uruguay, flag of. Guide to Hispanic Heritage. Britannica.com. [2007-06-27].